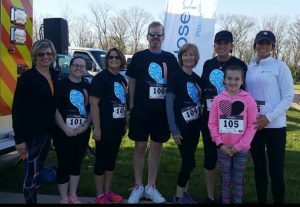 On Saturday, April 16, 2016, Perfection associates: Courtney Stylski, John Albrecht, Wendy Clouser, Julie Parr, Leah Hoover, Jack Albrecht and Katie Youngblood formed a team and participated in the Incline to the Finish Line 5K run/walk to benefit non-ambulatory children and adults with severe developmental disabilities at the St. Joseph Home of Cincinnati. Perfection CEO, Jack Albrecht has been on the Board of the St. Joseph Home for several years and this is a cause he feels strongly about. St. Joseph Home has been in service since 1873. It is a nonprofit ministry and part of the Sisters of charity of Cincinnati.